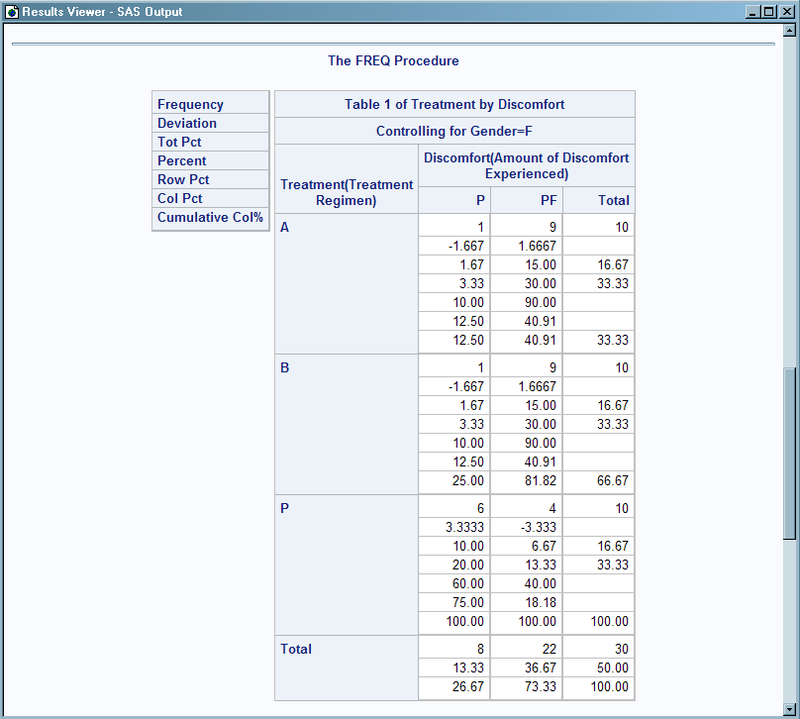 The TEMPLATE procedure enables you to customize the appearance of crosstabulation (contingency) tables that are created with the FREQ procedure. By default, crosstabulation tables are formatted according to the CrossTabFreqs template that SAS provides. However, you can create a customized CrossTabFreqs table template by using the TEMPLATE procedure with the statements in the following table. What Can You Do with a Crosstabulation Template? The legend text has been italicized and made smaller than the rest of the header text. The header text now uses the variable label “Gender of Patient” instead of the variable name. Row variable labels and column variable labels are used now instead of row variable names and column variable names. The background color of the non-summary rows alternates. The values in the grand total cell are now bold and italic. The Deviation cellvalues are now red when the deviation exceeds abs (2.0). The TotalPercent cellvalue has been moved from the middle of the other cellvalues to the bottom of the cellvalues.